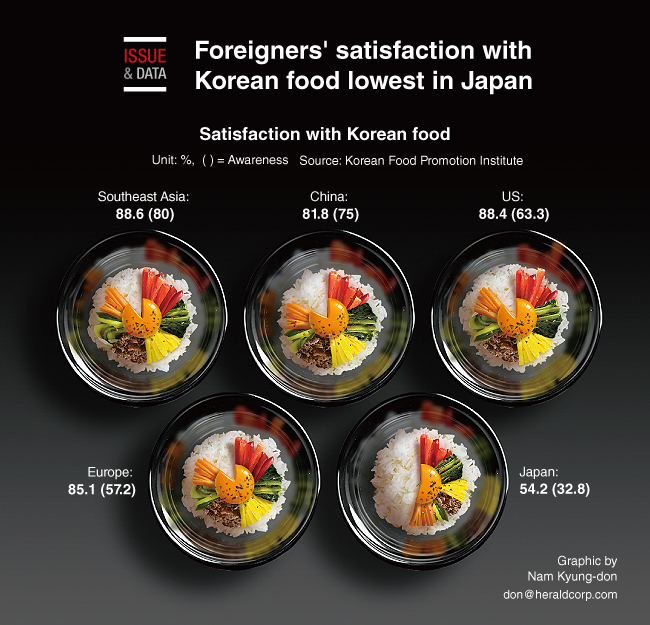 Foreigners satisfaction with traditional Korean food, known as “hansik” in Korea, was the lowest in the neighboring country of Japan, one poll showed, amid frayed ties between the two countries over a number of diplomatic issues. Japanese people’s awareness of Korean food came in at 32.8 percent, compared to an overall average of 64.1 percent, according to a survey from the Korean Food Promotion Institute. The poll was conducted online, questioning 6,000 foreigners living in 10 major cities abroad from Sept. 29 to Oct. 20. Southeast Asians showed the highest awareness of Korean food at 80 percent, followed by Chinese and Americans. Satisfaction for the food was also lowest in Japan, at 54.2 percent. The figure was highest in Southeast Asia at 88.6 percent, followed by the US with 88.4 percent.